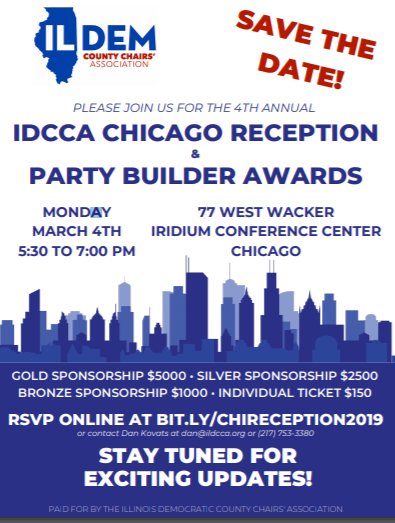 You are invited to join the Illinois Democratic County Chairs’ Association for our Annual Chicago Reception 2018 honoring Democratic Party Builder Award 2018 Recipients: William McNary, Citizen Action Illinois Co-Director Hon. Toni Preckwinkle, Cook County Board President Hon. Debra Shore, Commissioner on the Board of the Metropolitan Water Reclamation District Monday March 12, 2018 5:30pm – 7:30pm Hubbard Inn 110 W. Hubbard St., Chicago, IL 60654 Gold Sponsor – $5,000 Silver Sponsor – $2,500 Bronze Sponsor – $1,000 Individual – $150 Young Professional – $75 Click here to purchase tickets online!